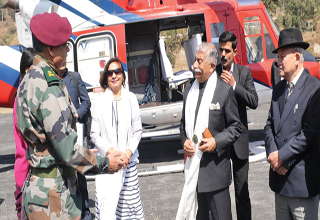 ITANAGAR, Mar 19: Governor of Arunachal Pradesh Dr B D Mishra has appreciated the Indian Army for conduct of Operation Samaritan under which the army undertakes various welfare projects for the population of remote areas in Arunachal Pradesh. He also appreciated the efforts of the Ball of Fire Division in pre-recruitment training imparted to the youths of Arunachal Pradesh, resulting in selection of youths for recruitments. The governor said this during a meeting with Major General R K Jha, General Officer Commanding, Ball of Fire Division at Rupa on Monday. During the interaction, the GOC assured the governor of the full operational preparedness of his division and the resolve of his troops to defend the Indian borders at all cost. The GOC highlighted the concerted efforts of both the army and civil administration in Tenga, Bomdila and Tawang towards maintaining excellent civil-military relations. He also impressed upon the governor for establishment of a Rajya Sainik Board for welfare of veterans, training facilities for Service Selection Boards for youngsters aspiring to join officer cadre in the armed forces, Sainik schools in Arunachal Pradesh, and financial assistance for making Sainik Aramgarh in Bomdila functional and renovation of the War Memorials at Bumla and Bomdila. The GOC also highlighted on the requirement for mobile polyclinic at Tenga and Tawang for providing much needed medical support to the veterans of the area, as they are located in a far-flung and remote locality. He also briefed on the requirement of empowering the deputy commissioner of Bomdila to issue ex servicemen identity cards. Speaker of Legislative Assembly, T N Thongdok was also present during the meeting.